Kaya is the most wonderful kitten. She's clearly beautiful and she has the greatest disposition. While she loves to play with us she also cuddles with me and sleeps on top of me. She seems to like everyone. She is especially fascinated by my dog , she can't stop staring at him . He's not at all interested. I consider myself very lucky to have her. I recently tried to bring her in my backyard with a harness and leash that did not go over well, she cried and I took her inside. I will post pictures of her soon. The problem has been that the pictures I have taken so far don't do her any justice. Floyd is doing great he is running around like crazy, loves to jump on the blankets and the box I have in the window for him, he is eating good and drinking his water. He love to play so much and boy o boy is he quick and a good climber...he is a beautiful little boy -Glenn is sleeping with him every night he loves to play and then he settles down and sleeps right next to him. Floyd wakes right up to glens alarm and glenn usually hits the snooze a couple time but all that means is its play time for Floyd... he kisses Glenn on the face in the morning and jumps all over him. Well let me go check on him right now I heard something fall upstairs, I just figured I drop you a not to tell you he is doing great. I just wanted to reach out and let you know that Lilly has adapted well to the household and sleeps on the bed with us every night now. All of her shots have been given up to date and she is a healthy growing kitten. She loves Sarah and follows her all around the house. She also likes Sarah to pick her and carry her around from time to time.I will sent you the certs from the vet once we get Lilly spayed. Have the rest of the kittens found homes ? I hope all is well ! First we would like to thank you for everything you have done, and second, all we can say is WOW. We can't believe what an amazing boy Cosmo has become. 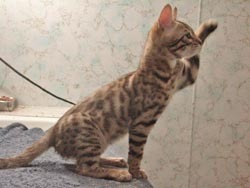 At 8 months he is already 11 pounds of muscle, and stretches 30 inches from nose to tip of his tail. He really looks like the pictures of RW SGC Alter Mystical Illusion. His rosettes get more distinct each month and he still has his glitter. 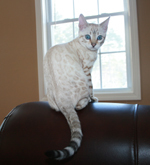 Cosmo is an outstanding example of the Snow Lynx-point Bengal breed. He plays in the water and tries to climb in the shower. Besides eating, his favorite pastime is fetching. He will bring his sponge ball, kitty spring, or mouse back to us to throw over and over and over! He can easily jump five feet off the floor to catch his feather toy. He sleeps in bed curled up next to us, usually under the covers. His purr is so loud it sometimes wakes us at night. 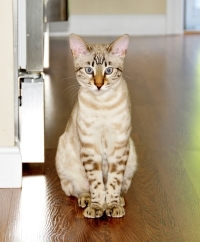 Truly he is an amazing and beautiful cat and we love him dearly! We can't imagine our life without having Cosmo and the joy he brings. Thank you for this wonderful boy.